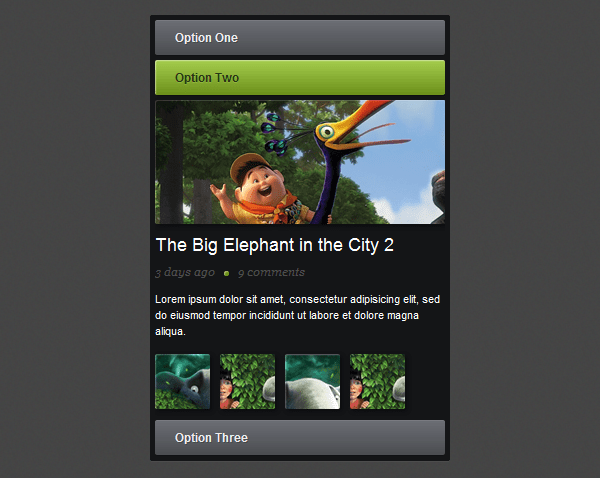 Today’s tutorial we will learn how to create a pure CSS3 content accordion. This will work on all browsers and devices that support the :target selector. Let’s create three divs with a different id and each div will have a link with the class of tab and a div with the class of content. To be able to style and open the accordion when we click on it we need to use the :target selector. The target selector will only work if we will have a link that points to an id and when we click on that link the id becomes the target element. We’ll start by adding some CSS reset styles to remove all the margins, paddings and borders. And then we’ll give a fixed 300px width (290px + 5px margin left + 5px padding right), background color, rounded corners and some shadows. Now let’s start styling the default tab header with some CSS3 gradients, shadows, rounded corners and some basic CSS properties (font, padding, color, etc). And then we need to add a hover and active style. We’ll change the text and the gradient color to a green one. In this step we will hide all the content and only show it when you click on a tab. To hide we’ll use the display: none; property and the display: block; for the target div. We’ll also add some transition animations to make it look better and a 100px height for the target div. Let’s add some content to the tabs. We will create a blog post preview with a title, paragraph text, some images and some meta info. You can change the markup as you like, this is optional, just to make this accordion more complete. The content styles are all basic except the CSS3 stuff, I recommend you to search the properties that you don’t understand on Google and you will find a lot of information about them. Also change the div height to 360px. 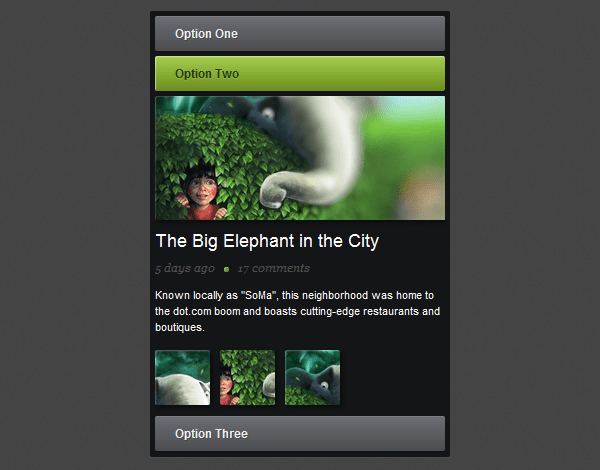 We have finished this Pure CSS3 Content Accordion. Hope you like it and don’t forget to live some feedback or any question you have in the comments. Great slide. Just a shame that, as usual, IE (9) doesn’t play ball :-(. There the slides jump and do not smoothly slide. But still very usefull and seeing as I am currently in need of suchs a slide I might give it a go:-). I’m asking for too much, probably, but it would be just fantastic if there was some way the content could determine the height of the targeted div, so that some of them could contain text only, in different amounts, and others images + text. You can do that by giving a fixed height to each tab. Why does the browser window jump every time you click on one of the tabs? That could get very frustrating for users. The only fix I know for that is using jQuery for the click event. This is another awesome tutorial. And, the final product is very useful too. The fact that it is in CSS so it will show up in all the modern browsers. Can you add a “recoil” feature to the first and the last tab so that when I reach the last tab if I click it again then it will recoil. The same with the first tab. When the tabs remain open it becomes frustrating to look at it at times. Moreover, the recoil with “easing” will be a better option. how can we remove tab id from url? This is almost exactly what I’m looking for… now, how can a rotate the container by 90 degrees so that the panels slide horizontally, but still have the text & photos read normally (left to right). This is a great tutorial! I just have one question and please forgive me if it seems ignorant or just plain silly but how would you go about making more tabs? HI, This is a great tutorial and what I am looking for. I have a question… Is there anyway that one can link the tumbnails so that when one click on a thumbnail it expands in the top container? I love, love, love this, but it doesn’t seem to work in IE8. Does anyone have a work around? I have a question. Can I use the code for free in any commercial website or do I have to buy a pack/code. And if so, where can I buy it? You can use it in any commercial website. so the height of the Tab would automatically resize to fit the contents but the transitions stopped working.